GLS Compact Composite Sampler - Gripp Inc. 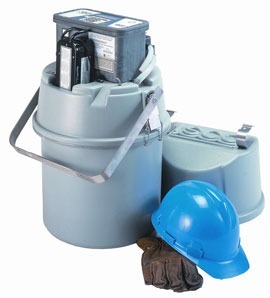 The GLS Sampler is designed to collect composite samples for general purpose monitoring. It holds a 1- or 2.5-gallon sample bottle, or a 2-gallon disposable ProPak® bag. Overall diameter is only 16.5 inches (42 cm), so GLS fits easily into manholes as small as 18 inches (46 cm), and also easily drops into most offset manholes. Dry weight is less than 25 lbs (12 kg), the lightest sampler in the Isco line. Hinged handle makes one-handed carrying a breeze. The patented LD90 Liquid Presence Detector and Isco pump revolution counting system deliver accurate, repeatable sample volumes time after time. For more information, download the GLS Compact Composite Sampler Datasheet PDF.